National park Paklenica is located on coastal side of the southern part of mountain Velebit. National park Paklenica was declared as national park in 1949. It has area of 95 km2. 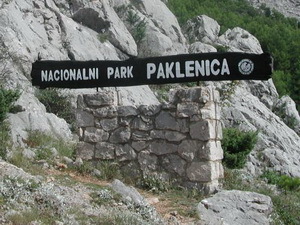 National park Paklenica is part of two counties, Zadar's and Lika-Senj county. Larger part of the park is in Zadar's county. You can get to National park Paklenica by car (highway A1 Zagreb-Split), airplane (airport Zemunik – Zadar's airport), by ferry (Ancona – Zadar), by train (Zagreb-Knin-Zadar). National park Paklenica is famous by its canyons, flows, various animal and plant life and untouched nature. It is consisted of Mala (Small) and Velika (Large) Paklenica. East part of the park is inaccessible and wild. 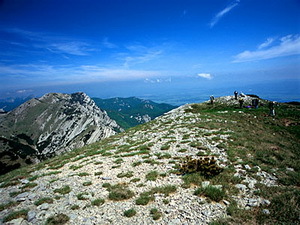 In National park Paklenica is highest peak of Velebit, Vaganski vrh (Vaganski peak, 1757 m). 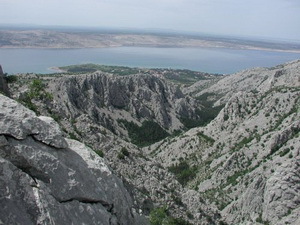 Most attractive parts of south Velebit are canyons of Mala and Velika Paklenica. 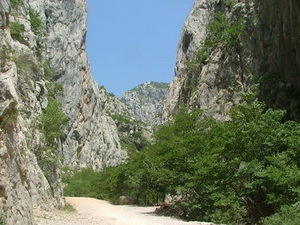 Canyon of Mala Paklenica is 12 km long, 400-500 m wide. 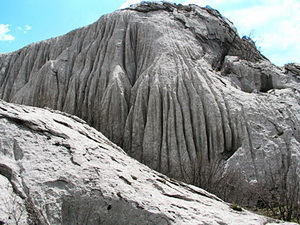 Between canyons of Mala and Velika Paklenica is karstic and inaccessible terrain. Canyon of Velika Paklenica is 14 km long and 500-800 m wide. Most attractive part of this canyon is sharp downfall from Anica luka. 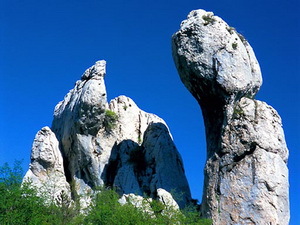 National park Paklenica is rich with beautiful karstic terrains and underground shapes such as barrows and caves. 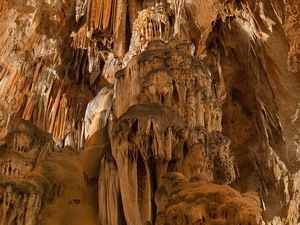 Most known foundings are Cave in Zubu Buljme and Barrow in Zubu Buljme. In Barrow in Zubu Buljme has been found skull of a cave bear, around 30 000 years old. 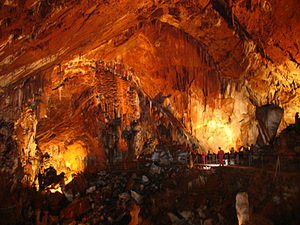 Other known caves are Cave at Knezevic's, Cave Mokraca, Krumpirova cave, Lukceva cave known as Skiljica stan. Cave Manita pec is 175 m long. Temperature in the cave is around 10°C. Altitude of the cave is 570 m.
Ponor na Bunjevcu (Bunjevac abysm) is deepest barrow 534 m deep. Barrow Vodarica is the longest barrow 300 m long. Permanent sources of fresh water in National park Paklenica are Crno vrilo, Velika Močila, Kontinovo vrilo, Strazbenica and Pecica. During the winter, spring and autumn, stream Velika Paklenica flows directly to the sea, because of the rainy season. Source of Mala Paklenica is above Vlaskogradska draga, 1000 m high. In National park Paklenica it has been founded around 1000 plant species. Some of the species are: daisies, grasses, mints, roses, carnations, legumes. Under the sharp rocks and cliffs, by scraping and ambrosia of rocks and with influence of the sun, rock creeps are developed. 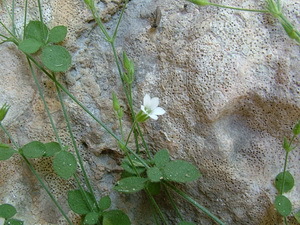 Many plants grow on those rock creeps, such as: Seseli malyi, Aquilegia kitaibelii, Paronychia kapela, Linaria Alpina. 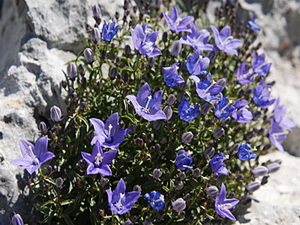 79 species found in National park Paklenica are protected, such as: Croatian bellflower, Window bellflower, Waldstein bellflower, Arenaria orbicularis. Arenaria orbicularis grows only in area of Mala and Velika Paklenica and nowhere else in the world. 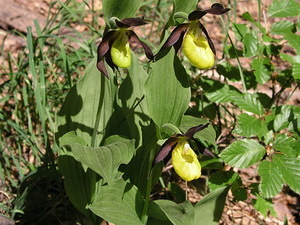 Also one of the most beautiful orchids in the world grows in National park Paklenica, Lady-slipper. 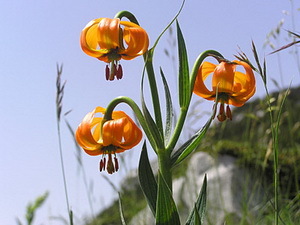 Many other plant species grow in area of National park Paklenica: tulips, mountain madworth, grape hyacinth, Carniolan lillies, buckler mustard. Woods is the main reason why Paklenica was declared as national park. Different types of woods grow in different heights. Lowest part is covered with woods of hornbeam and pubescent oak. From 650-900 m high grow woods of black hornbeam and beech. On shallow and dry parts 400-1200 m high grow woods of black pine tree. Premountain beech woods grows on height of 1000-1450 m.
National park Paklenica is rich with animal life, especially with animals that are very known to visitors, such as butterflies. There are night and daily butterflies. 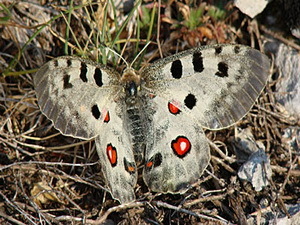 Most known night butterfly is Saturnia pyri (giant night peacock). Most known daily butterflies are scarce swallowtail and swallowtail. One of the most beautiful butterflies in Croatia is Apolon (Parnassius apolo). 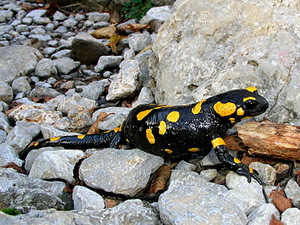 In National park Paklenica has 31 species of amphibians and reptiles and 11 species of snakes. Only toxic snakes in this area are nose-horned viper and Orsini's viper. Orsini's viper is very rare. Most often seen mammals in National park Paklenica are: deer, fallow deer, chamois, wild boar, brown bear, fox, wolf and lynx. Caves in National park Paklenica are homes to many animal species such as: insects, Nebria velebiticolla, moths, bats and many others. Most early foundings of human activities in south Velebit come from the end of ice age. Until that time, sea level was 120 m lower than today. Inhabitants started moving to higher parts. 8 000 years ago shepherd life started to develope. Most of the tools used in that time were found in caves. First bigger forts and castles were built in last 2 000 years. There were also found old graves of former rulers. Town Starigrad was founded in 1st century AC. It was surrounded with walls. In the early Middle Ages Croats inhabitated area of south Velebit. 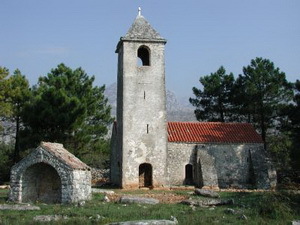 In Starigrad and Rovanjska are found churches from 9th and 10th century, St. Peter's Church and St. Juraj's Church. Vecka fort and Paklaric fort are built, as it is beleived, at the end of Middle Ages. During the next 2 centuries, Turks were attacking most of the areas in Dalmatia. After Turks ended the attacks south Velebit got under the rule of Venetia. Inhabitants were mostly directed to livestock farming. Many remains of churches, chapels, altars and „mirilas“ show us that many people stayed in mountain areas during the summer. Mirilas are graveyard monuments within paths and roads. In area of National park Paklenica are few villages, but only inhabitants are married couple living in settlement Ramici. 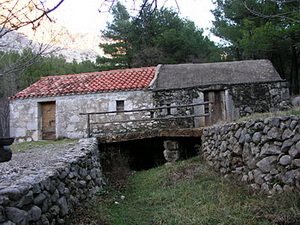 In 19th century in area of National park Paklenica have been built 7 mills. Neither one is in the function today. Srednji Marasovica Mlin has been restored in 2000. and it is opened each day from 08-19 o'clock. 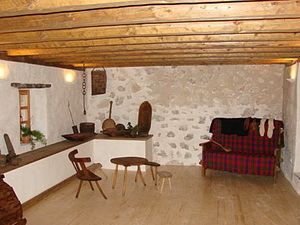 Ethno-house Marasovic is located in settlement Marasovici. It consists different agricultural, live-stock farming and house tools used in former ages. In the house is also small tavern and info-desk. While hiking or climbing you can use one of the Mountain homes or shelters in the National park Paklenica. Mountain home Paklenica has rooms, kitchen and dining room. Shelters in the Park are Shelter on Struge, shelter on Ivine Vodice, shelter on Vlaski grad. Shelters can take 8-20 persons. Climbing is allowed only in climbing area. Climbing is strictly at your own responsibility. Solo climbing is forbbiden. Hikers should bring adequate equipment while hiking: matches, lamp, candle, first aid equipment, fresh water, hiking shoes... Hikers should not leave trash in the Park, light a fire nor throw cigarettes. In Presentation center you can listen and see what you are about to visit in National park Paklenica. Ticket prices in January, February, March, November and December for adult person is 30 HRK (around 4,05 EUR). Climbing ticket for three days is 60 HRK (around 8,10 EUR). Climbing ticket for 5 days is 90 HRK (around 12,16 EUR). Entrance ticket for Manita pec Cave is 15 HRK for adults (around 2 EUR) and for children 10 HRK (around 1,2 EUR). Exact prices and additional offer you can check in entrance of National park Paklenica.